11-12 Ağustos tarihlerinde ise dans gösterileri ve konserler düzenlenecek. İskeledeki sahnede, Türkiye, Peru ve Şili'den katılan topluluklar dans gösterilerini sunacaklar. 11 Ağustos günü akşam 9'da TRT sanatçısı Nusret Yılmaz, 12 Ağustos Pazar günü akşam 10'da ise Göksel sahnede olacak. Gallipoli Golden Sardine Festival was cancelled by Gallipoli Municipality. The reason is density of municipality works. In April, the festival was announced as 07-12 August 2018 but municipality will arrange Summer Events instead of the festival between 07 and 12 August. On 7 August at 6 pm, personal watercolor exhibition which is prepared by Mehmet Hamdi Hidayetoğlu, will be opened. It is about Safranbolu which has small and pretty local houses at province of Kastamonu,Turkey. The exhibition could be visited until 12 August. Children football tournament will be arranged in memory of our martyr commander Koray Onay. There will be four teams which are Geliboluspor, Çanakkale Fener Spor Klübü, Kepezspor and Yeni Eceabatspor. All of them try to win the tournament. 11-12 August, dance shows and concerts will be at port. Nearside of the port, dance communities which are coming from Turkey, Peru and Chile will show their works. On 11 August, Nusret Yılmaz will sing traditional Turkish songs at 9 pm. 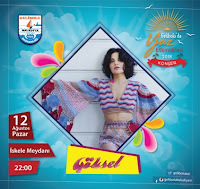 Göksel will sing popular Turkish songs on 12 August at 10 pm.